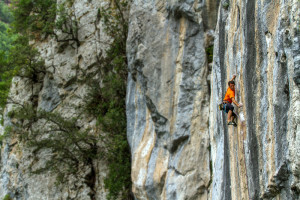 Here’s a crag that I couldn’t squeeze into Roca Verde 2. It appeared in the first edition but as it’s a bit of a ´locals´venue I didn’t have the space in the expanded version. 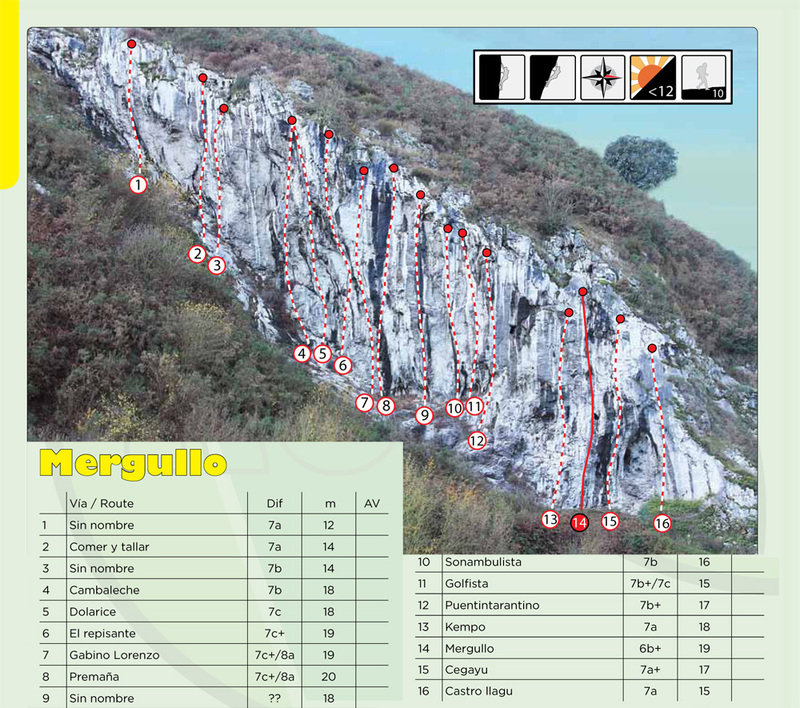 Mergullo is a small venue that overlooks the ‘Senda Verde’ just outside Oviedo. 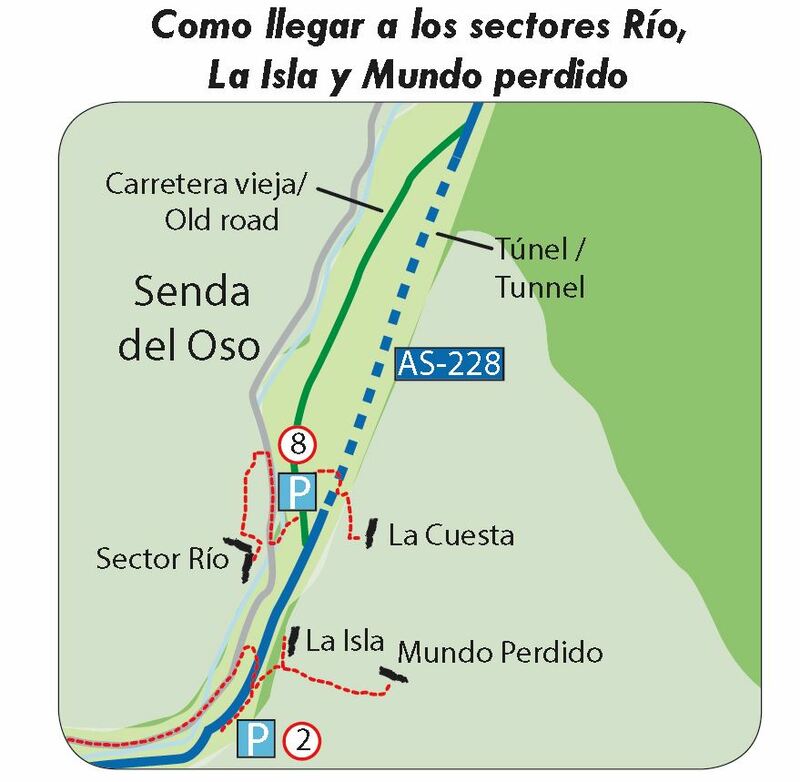 It’s probably the closest crag to Oviedo and can be accessed on bike or by walking. 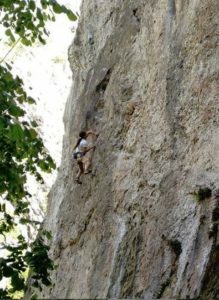 However, it’s not the most popular venue and although there are some decent routes, the lack of traffic, the crag’s orientation and the two massive quarries nearby mean that the routes are quite dusty, making them difficult to enjoy. 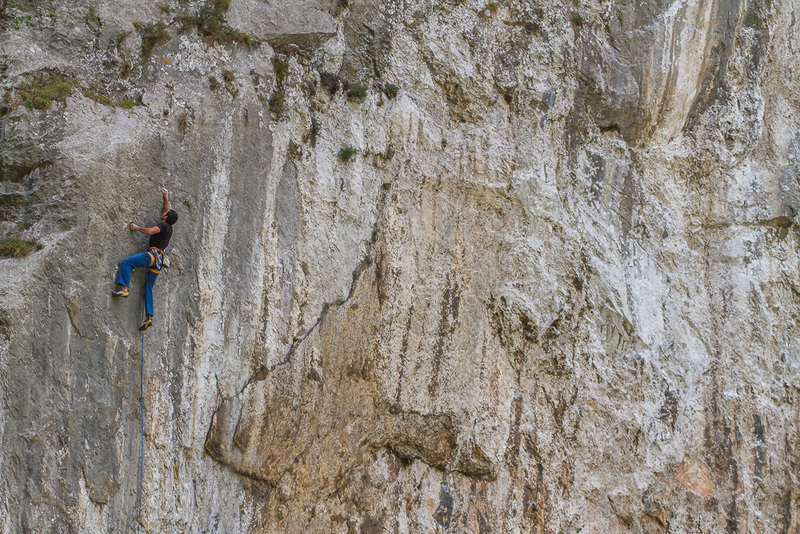 The climbing is hard and fingery and there aren’t any easy routes TBH…but the routes are good they just need a clean. Happy new year everyone. As it’s now 2019 it would seem to be a good time to round up what’s been happening in 2018 and maybe a good place to start is the ever busy valley of Teverga. 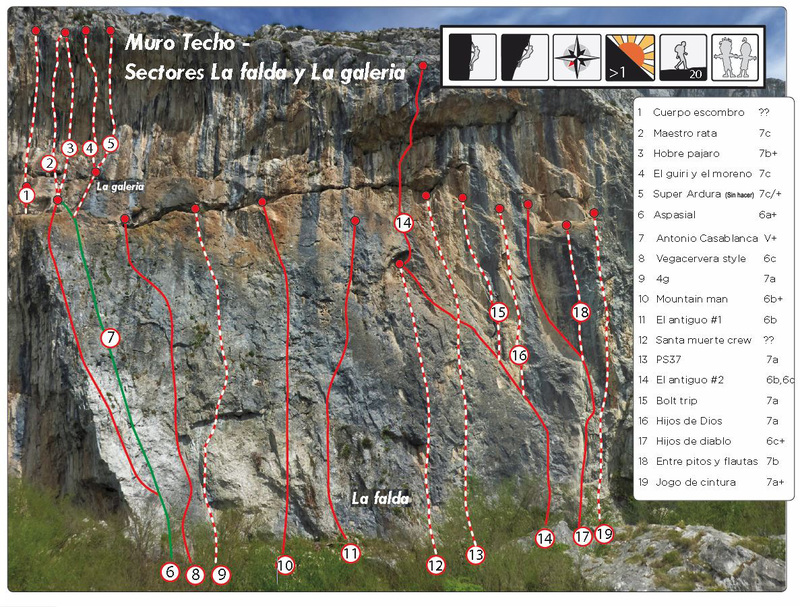 There’s plenty of new routes so I’m going to put them up in three posts…and the next sectors are also sectors that was mainly finished in 2017; La Falda and La Galeria. These sectors in reality are an extension of Muro Techo – if you keep walking past the existing routes you will get to them in a minute more. 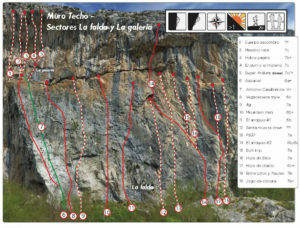 La falda (the skirt) is the huge slab while Sector La galeria is the section of tough tufas which overhang the slab below. The routes in general are all quite intricate climbing and with a good spread of grades it’s a great place for a mixed ability group – it’s also worth noting that a 70m rope is needed for nearly all of these as they’re longer than they look. 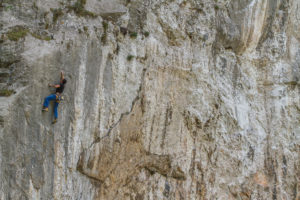 The routes in ‘the gallery’, La galleria, which start from the ‘salathe’ ledge are almost the exact opposite; short steep and generally quite brutal. They also put a bit of fear into the proceedings as, starting at 35 metres, the cruxes are at about 50 metres off the ground!! 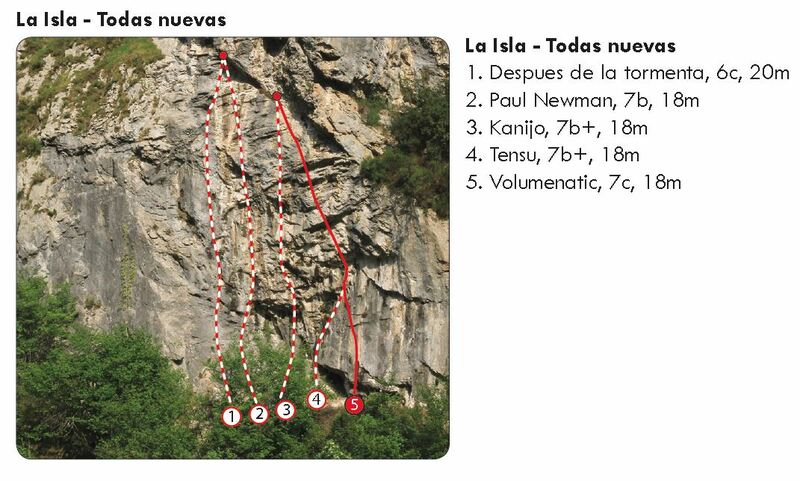 Like always these new routes are never the work of a single person and so it’s easier to thank everyone who is usually involved in new routing in Teverga so thanks go to Lolo, Miguelín, Berto, Hectorín, Moss, Mulero, Gali, Raúl, Josete, Jose Camino, Armando, Cesar, Junior, Pablo Martín, Tino, Javi López, Mariluz, Pablo, Diego, Dani, Anselmo, Richie, Javi Garzo, Brillan, Espolita and anyone else who’s helped!! 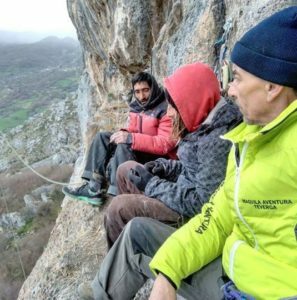 And remember if you do come to Teverga that all these routes are made possible by the work of the local climbing club so if you do stay in the parking area it’s worth remembering that you can make a donation at the club hut to help with bolts and bolting!! It’s out! 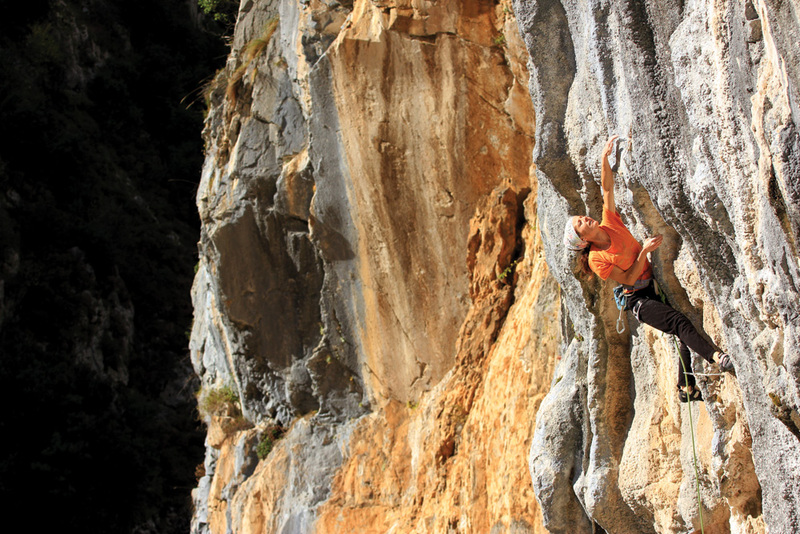 The guidebook to Spain’s best-kept secret and one of the best summer climbing venues in Europe. Had enough of going to the usual places and you fancy a change? Fed up of the crowds, the heat and the polished routes? 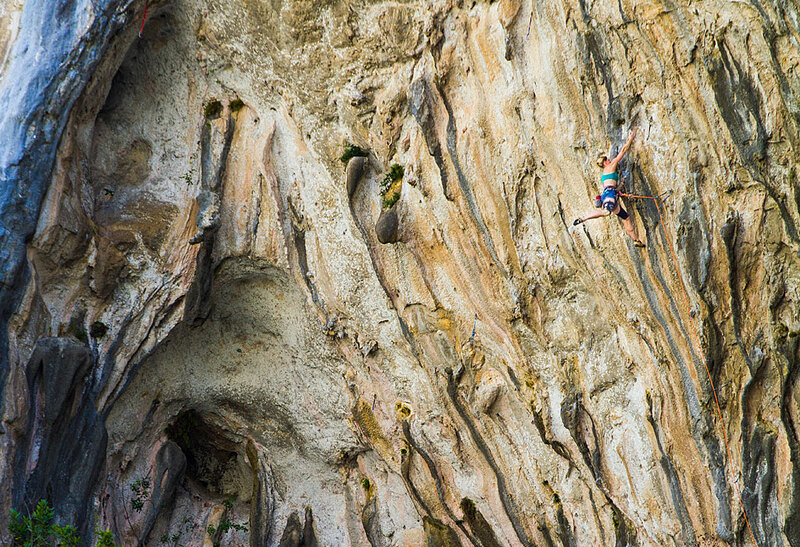 Look no further, the crags in this book have got everything you’re looking for. 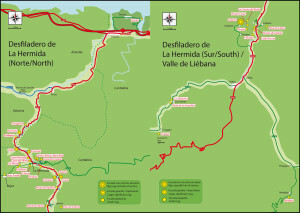 El Desfiladero de la Hermida covers the climbing centred around the village of La Hermida, which is located in the gorge called El Desfiladero de la Hermida that runs north/south through the eastern end of the picturesque Picos de Europa, from Panes to Potes, on the border between Cantabria and Asturias. This is a really beautiful part of Spain; known as “green Spain” due to the abundance of vegetation as a result of the maritime climate, the scenery is simply stunning. The topography is classic karst limestone. The gorge has very steep sides that are riddled with rocky gullies that lead up to high craggy peaks with breath taking views. There are crags everywhere and the potential for more development is obvious. It gets even better; the summer temperatures are typically in the mid-twenties, which make such a pleasant change compared to many parts in Europe. In fact a normal season here extends from late spring (as the tufas dry out) until early winter, when the first of the rain which keeps the valleys so green arrives. 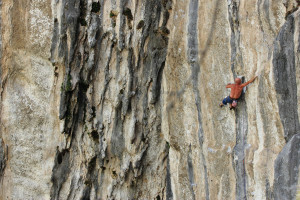 Though the addition of many quick-drying, walls and slabs outside the main valley means that there should be something to get on all year round. There is plenty to do on rest days; just a 30 minute drive away is the coast with the possibility of surfing the Atlantic swell. 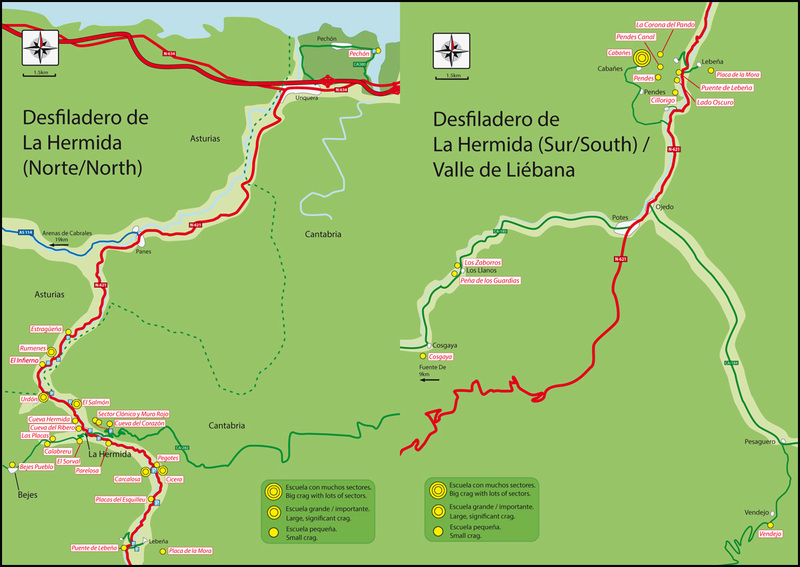 Alternatively, there are numerous paths that can take you up into the heart of the Picos de Europa or you can take the cable car up to the most famous mountain in the area, the Naranjo de Bulnes. If all of the above activities sound too strenuous, you may just prefer to go and relax at the climbers bar in La Hermida (La Cuadrono) and sample Chucho and Angela’s wonderful hospitality. However, if you’re staying in Potes, try the climbers bar (La Reunion) and sample some of their home made beers or enjoy a nice cheap coffee (don’t forget this is Spain, so prices are always very reasonable). 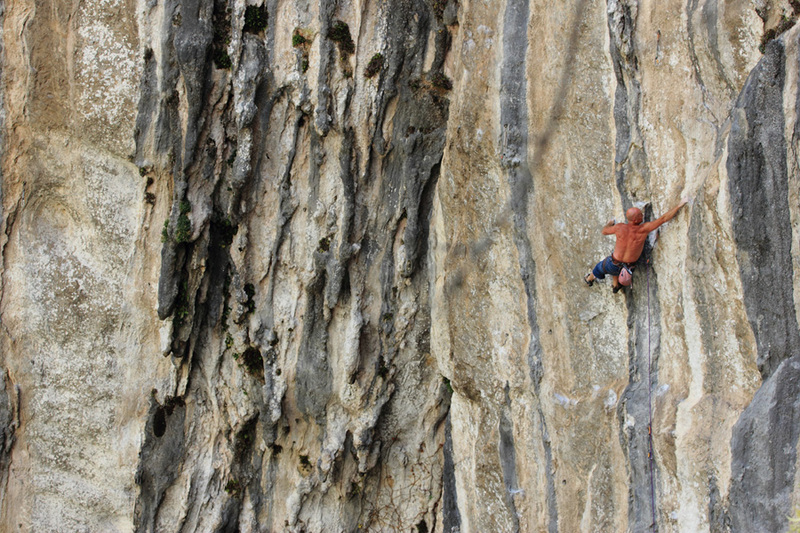 For years there have been rumours of great climbing in this part of Northern Spain but information was always scarce. 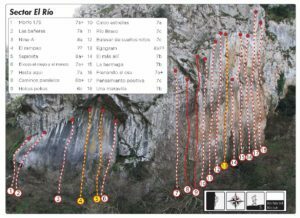 Then three years ago Richie Patterson published the excellent Roca Verde, a selective topo covering some of the crags in Cantabria, Asturias and Leon. As a result the area started to receive more attention, justifiably so. 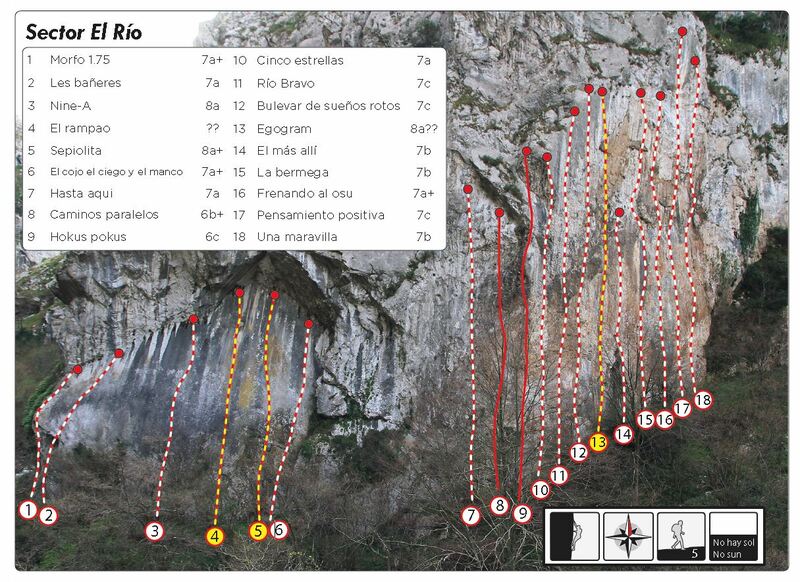 Due to this new found popularity Richie, in collaboration with the local Cantabrian climbers, has put this definitive guidebook together, specifically covering all of the new (or previously hidden) crags in the La Hermida valley, and what a guidebook it is. The first thing you will notice when you flick through La Desfiladero de la Hermida is the attention to detail that has been put into the presentation and that it is written in Spanish and English. The introduction is concise, yet has all the necessary information you need, including a very clear general map, where to stay and what the topo symbols mean. There is an interesting section on ‘Geography and Wildlife’ as well as a very important section on ‘Access and Etiquette’. 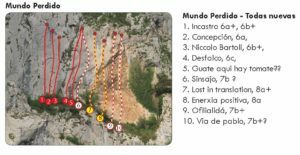 Each crag has its own introduction, including the style of climbing, orientation regarding the sun, walk in times and access map with GPS coordinates. The topos are very accurately drawn on clear colour photos and printed on top quality paper. All pitch lengths are given. However there are no stars. 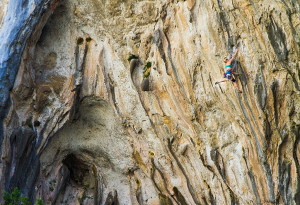 The authors don’t want climbers to be drawn towards particular routes, with the result that they become polished and end up with queues during busy periods, they want you to find out for yourself and have fun doing so. 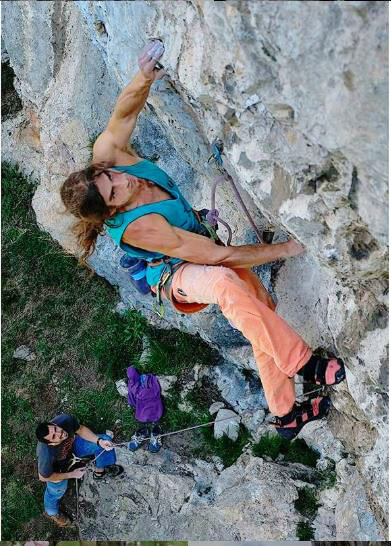 The action photos are some of the best I have seen in a climbing guide and really do give you that all important first impression; in other words they fire you up, your fingers start to sweat and you start mentally planning how to get there as soon as possible. 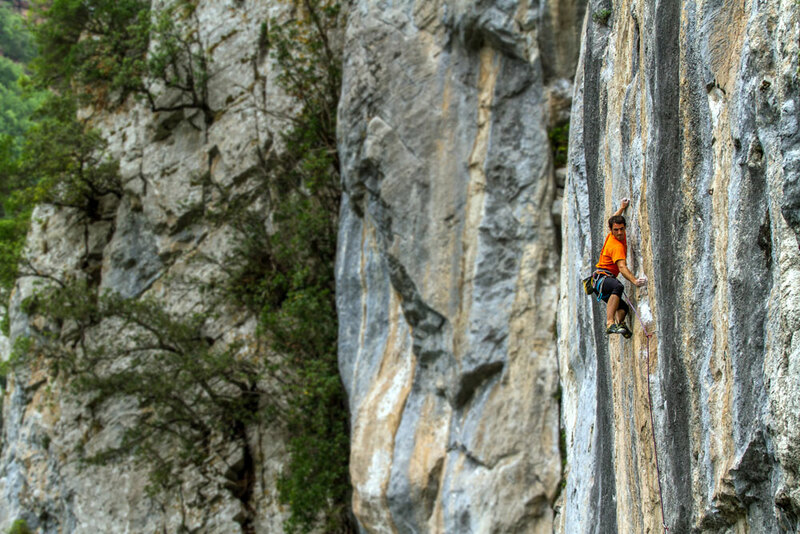 The valley is already quite well known for its amazing tufas at steep crags such as Rumenes and El Infierno. However, this is not just an area that suits climbers operating in the big numbers because what is not so well known, is the fact that there are also many crags that offer really enjoyable climbing at a more reasonable standard in equally impressive surroundings. In fact much of the new guide is taken up with crags with amenable grades that should allow mixed parties to enjoy the valley more; making a morning cranking on tufas followed by an afternoon on the slabs (or vice versa) a practical option! 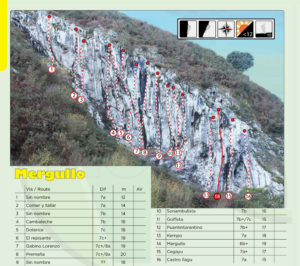 The guide includes a total of 32 crags, of which 24 are published for the first time, including the jaw-dropping Cueva Carcalosa (which will soon become internationally important for those seeking long steep voyages in tufa paradise) and the long established, but nonetheless previously secret, Cicera (with its wealth of demanding crimpy climbing in the summer shade). 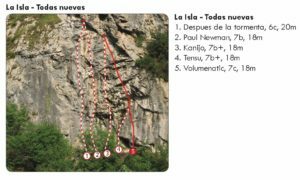 La Desfiladero de la Hermida is in A5 format, has 176 pages and almost 700 routes to choose from III+ to 8c+ and offers great value at £20. Please bear in mind that it is the only definitive guide and purchasing it will help contribute towards future equipping in the area. After you’ve been climbing, don’t forget to have a beer at La Cuadrona, followed by a swim in the hot springs up the road. My advice: skip Ceuse this summer, buy this topo, book your ferry. Job done!